CINDY LOU CHENARD has been adding color to the world since she was a young girl. Her early adventures with a paintbrush lead to a Bachelor of Science in Graphic Design/Textiles from North Carolina State University - School of Design. She worked as a colorist for the textile industry, and an art educator, prior to establishing herself as a small craft business entrepreneur. For several decades Cindy created art weavings and is well known as a fiber artist. A handful of years ago Cindy’s lifelong appreciation for mid-century modern art and architecture, and its minimalist designs and bold colors, lead her to once again pick up a paintbrush - and a saw, and her Modern Landscape & Abstract Painting career began. Working with meticulously balanced shapes and carefully harmonized color arrangements, Cindy creates dramatic eye catching images. Many of her paintings are executed with acrylic paint on canvas. Cindy also works with multiple layers of shaped birch wood in a technique she has developed. 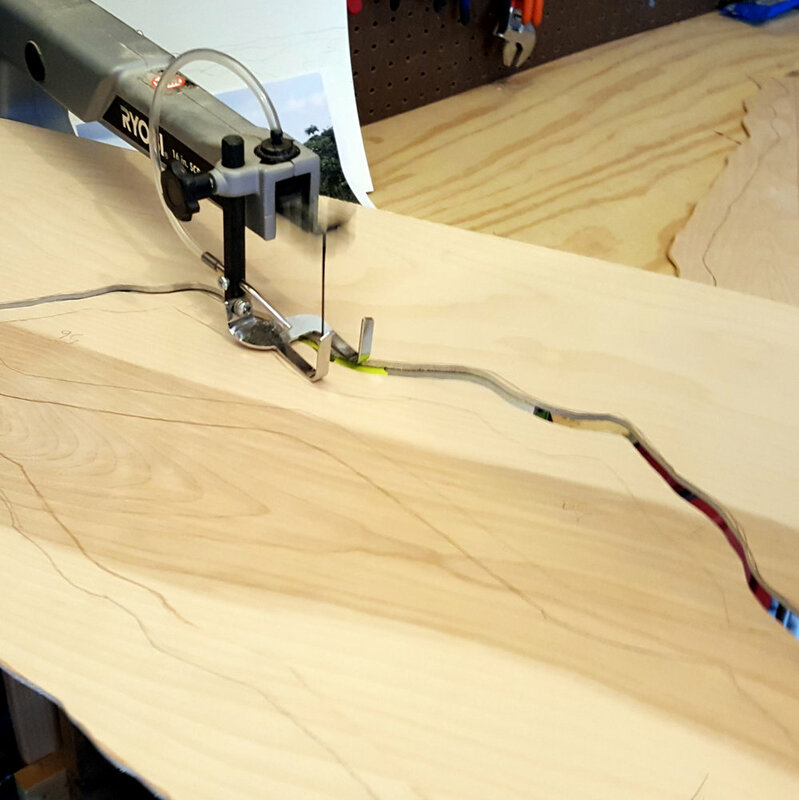 She calls this process “Art Des Couches De Bois" - French for "art in layers of wood". The layers of these dimensional paintings create shadows which gives the viewer a different looking painting from every angle. 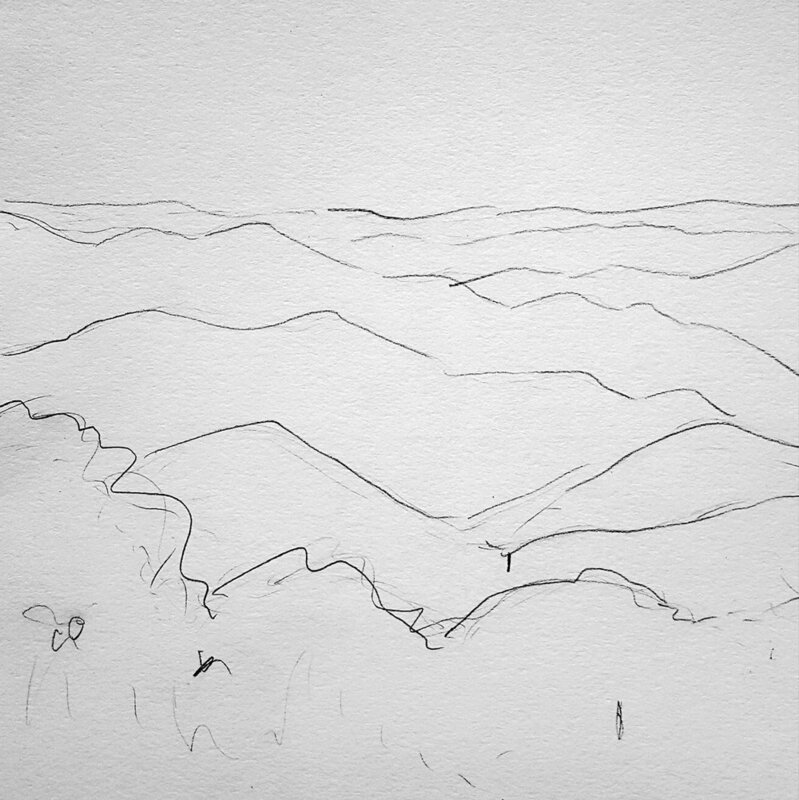 Cindy’s paintings begin with a photograph, or a sketch, of a mountain scene or abstract design. Some of these ideas become acrylic paintings. 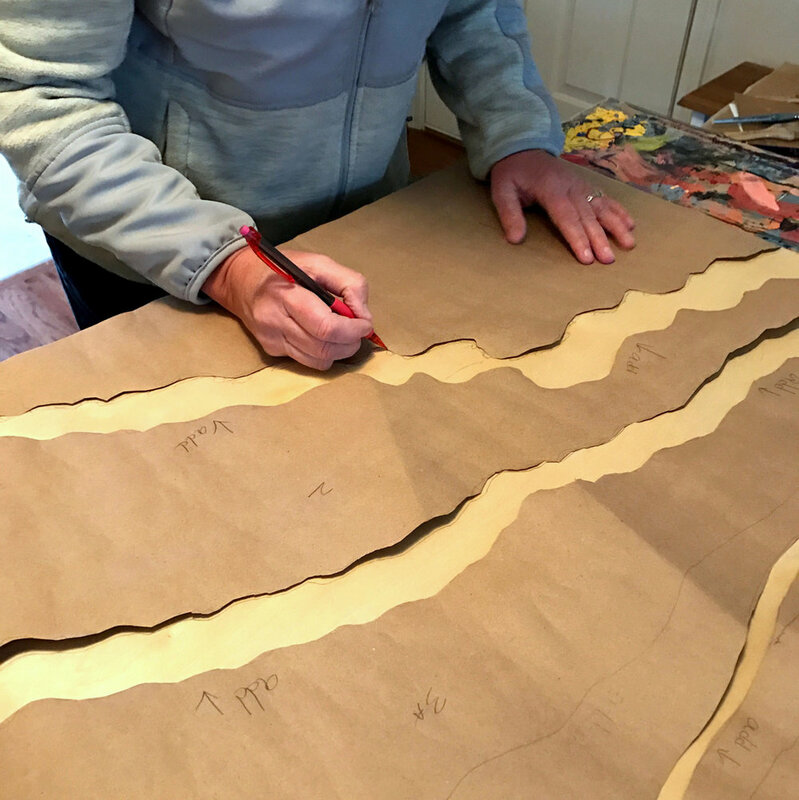 For her Art Des Couches De Bois images, Cindy scales up her design to the desired size, and transfers the layout to pieces of thin birch plywood. 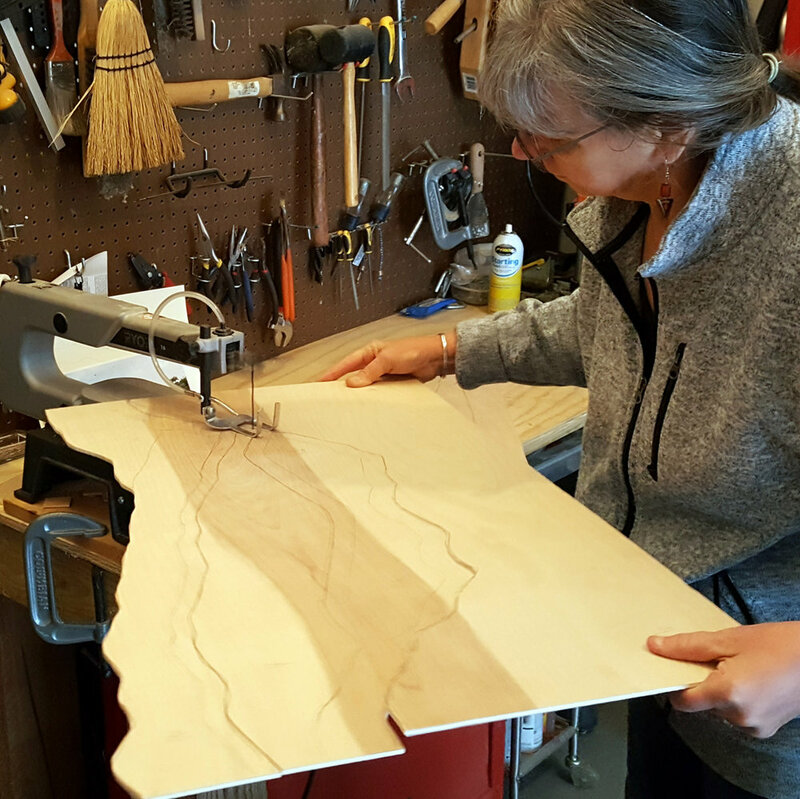 Using band and scroll saws, Cindy cuts out shaped pieces of wood. She then sands and prepares the wood for painting. Cindy is known for her beautiful use of color, which is carefully planned, and mixed for maximum textural effect and subtle gradations. She strives to play colors off of each other, have a balanced feel to the mood the color creates, and to reflect the richness of color in nature. After each piece of shaped wood is painted Cindy assembles the layers, securing the pieces with adhesive and pressure. Custom border braces complete the masterful craftsmanship. 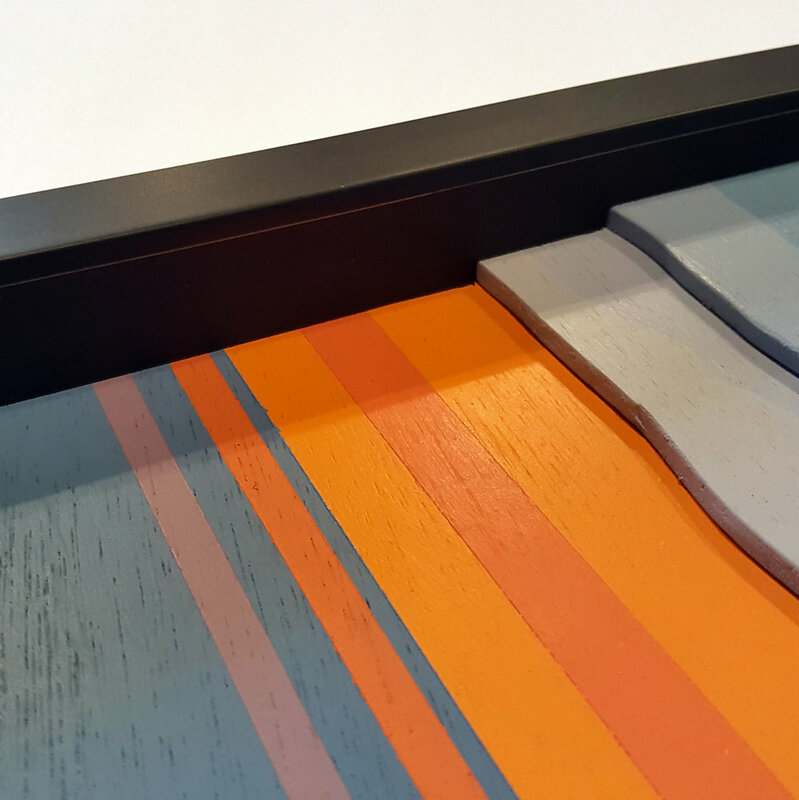 All of Cindy’s pieces are finished with professional ¾ to 1 inch wide black wooden frames and hanging hardware - ready to take home and place on your wall. Cindy Lou Chenard is a native North Carolinian and is a descendent of generations of artisans. 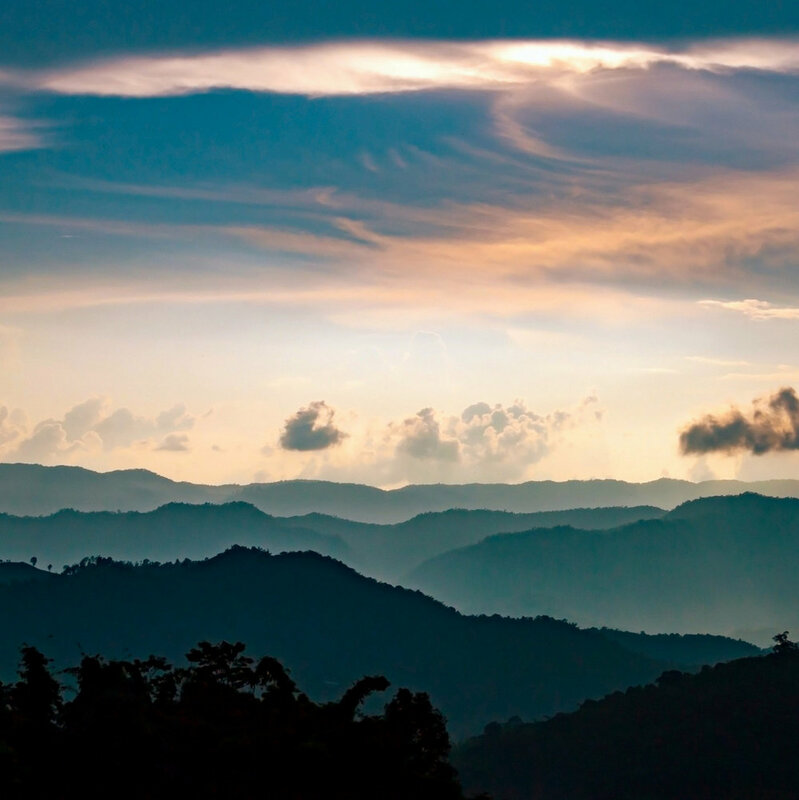 She lives in BLACK MOUNTAIN, a small town nestled in the vibrant arts community of Western North Carolina. She goes hiking as often as she can, has a lifelong fascination with geometry, and is inspired by the deep sense of space and ever changing colors of the Blue Ridge Mountains. Cindy is honored to be an award winning artist whose work is enjoyed by collectors around the world. Her work is a favorite among art lovers frequenting the RIVER ARTS DISTRICT of Asheville, NC where she has a studio at 362 DEPOT GALLERY that she invites you to visit!